Magical Moments: When they get it! It is the beginning of term, and I’m still trying to catch up on my marking from the previous semester. This is what happens when deadlines are all wonky and I spend my holiday doing ridiculous things like -oh, I don’t know- relaxing! Back to the point. Magical Moments are the ones that we need to share. Several of my students have made significant progress! Students who were unable to construct a correct sentence without extensive support, have produced whole paragraphs! Students who struggled to complete a 5 question worksheet without giving up, completed a huge assessment task that took them 4 x 70 minute lessons. While it took a bit of cajoling and encouraging from teachers and teacher aides, they finished the assessment. Some of my students had never worked so hard on one assessment task in their lives. I’m so proud of them! As teachers, we need to remember and share these Minute, Magical Moments. We need to celebrate the little triumphs. We need to appreciate the wonderful after-glow that comes from seeing the difference we have made. We need to commend our students when they make a commitment to learning and exceed everyone’s expectations. We need to keep that good feeling we get when the kid ‘gets it’ because these magical moments can be rare! I hope you are having some magical moments in your classrooms. I hope you are celebrating them and sharing them with your colleagues so they can enjoy it too. Please share your magical moments with me! If you have had a magical moment (it could have been ages ago) please tell us about it in the comments. Marveling at my Magical Students! If you have a large insect on your bulletin board that is labelled and surrounded by bug reports, and the “mini-beasts” unit was last semester, it’s time for a change. Block colours help with this point too. It is okay for boards to start bare and be added to as a teaching and learning unit progresses. In fact, this is a good way to make sure your bulletin boards are up to date and referred to by students. Word walls are a common example of this. Another way to keep things current is to make your boards generic. Five-Star Work would be a great board for students to show off what they have done in practically any unit theme. This board can stay the same all year round, but look different almost every week. Some teachers purposely design their bulletin boards so that some elements are generic and will be static for the entire year. They leave space for charts to be added, like in the pinned image below. Some teachers choose to create one or two interactive boards which are almost constantly changing. Here are some examples of interactive bulletin boards that are easy to set up at the beginning of the year and maintain (as a current and useful learning tool) throughout the year. Most of the pins below show boards that ask students to respond or add to the board using post-it notes. You can change the essential question weekly or daily if you like and this can provide valuable feedback about student learning or classroom climate. One of the pins is year long – students can add names of books they have read or interesting words they find when reading (posted in the classroom so they can use them when they are writing). Many teachers turn one of the bulletin boards in the room into a simple game. One example is a large boggle board- click here to find lots of resources and classroom examples of classroom Boggle on Pinterest. The letters are randomly selected and posted at the beginning of each week. If and when students finish early they can write down any words they find using the letters on the board. The student with the most words at the end of the week can receive a small prize. You can make the scoring more complicated by assigning points according to the length of the words. Other simple games such hangman or who am I? could be used as well. Riddles, guessing games or weekly challenges could also add an interactive component to your classroom walls. WOW- Lots of Pins to check out in this post. If you need ideas for bulletin boards in your classroom, you MUST visit Pinterest. It is the best location for seeing what is possible in your classroom and learn about how other teachers (just like you and me) have used their bulletin boards to enhance student learning. This post brings our series to a close. Please comment if you have any lessons you have learned or ideas you want to share with us. Feel free to use the comments form to ask any questions too. Back to Work… you wouldn’t believe this, I actually have a bulletin board project I have to finish! A busy bulletin board is often time consuming and becomes confusing. Simple boards are easier to construct and are more likely to be enjoyed by students and classroom visitors. A welcome board could include a simple slogan, an icon or image and space for student photos/ names. That’s enough. Your bulletin board is like a billboard, it should be accessible anywhere in the room. Keep the text large and limited. Use symbols, icons and images to get the message across. Considering this post is about simplicity, I’m going to prove I have learned my lesson. Here is an example of a simple and effective bulletin board. I can’t help but show you one more. I love this bulletin board! It is a simple idea; you can add to it throughout the year and there are only a few elements to it. Admittedly, the border could be a bit tricky for the less artistic teachers out there, but there are ways around it (think cellophane or streamers). PRINTABLE Bubble Letters: I found this website on Pinterest. It has a selection of free printable alphabets. Save the file for yourself and when it’s time to create a bulletin board, you can print the letters you want on coloured paper/card and cut them out ready to use. Laminate them for re-use. Simple saves time, money and stress. Do yourself a favour and keep the basic elements big, get rid of the unnecessary bits and pieces. This one applies to several steps in the process. If you see a bulletin board you like, snap a pic and keep it for reference. Here are some photos I took when visiting the classrooms of my colleagues. When constructing a bulletin board take photos of the materials you used and every step along the way. Especially record the mistakes, so you remember what not to do again. I recently had a disaster while constructing the border and background for two of my bulletin boards in the classroom. I was too cranky to take pictures, but I won’t forget what happened or the materials that didn’t work. I take photos of all my boards so that if I am teaching the year level and the unit again I can replicate the bulletin board/ display. If the display had some flaws, I can make small changes to fix them. If the display was a complete disaster, I can make some huge changes to create a better display next time round. Here are some images of bulletin boards that I have created for my classroom in 2012. The classroom was used for year 8 and year 9 Literacy and Numeracy support classes and small group withdrawal programs. Literacy Space: The posters focus on reading and the display was created to promote positive attitudes towards reading. Test Taking Strategies Board: This wall space developed over time and this photo was taken a few weeks into the 8 week unit. We were preparing for NAPLAN testing. 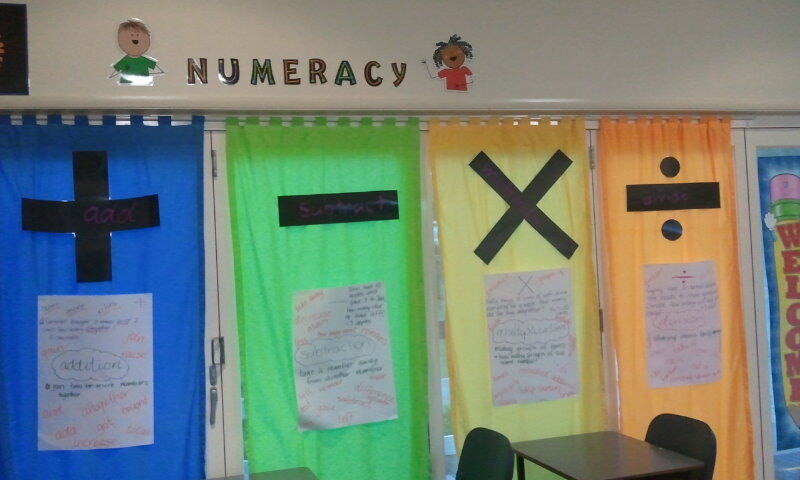 Numeracy Space: Operation symbols head up the anchor charts with key information about each operation. The key to this particular lesson, is to use the images as a tool for reflection. It is great to take pictures of the boards that others create and we like. 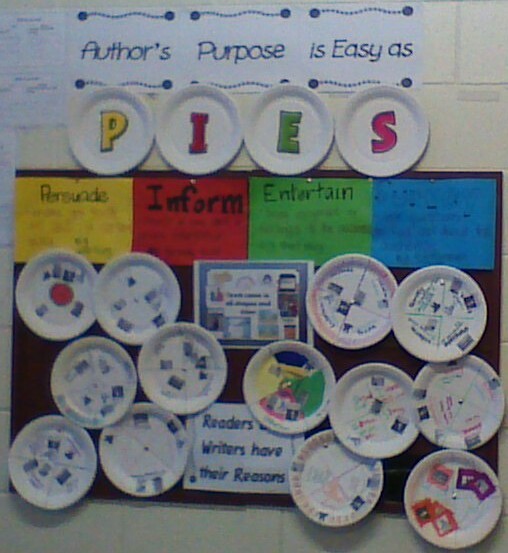 It feels good to take pictures of the boards that we have made and are proud to share with our blogging buddies. We have to remember that bulletin boards are not for making the classroom pretty. Bulletin boards and posters and charts and anything that we display in our classroom, should have a legitimate purpose. Taking photos of our classroom displays allows us to use them for our future planning but also helps us to develop as professionals. We aren’t just looking at the artistic aspects of our classroom walls, but the pedagogical aspects as well. So, there is something to think about. What displays are taking up the space on your classroom walls. Do they have a purpose? Do you have a record of them? Do you plan to change them in the future and why? By the way, it’s okay to have a poster because you like it. It’s okay to have a space in your room that is about fun. Teachers (and students) spend a great deal of time in the classroom and it needs to be a positive and inviting place. 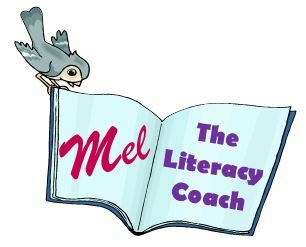 How you ‘decorate’ is just as important as how you plan the lesson. No Resources today – but stay tuned for more lessons learned about Bulletin Boards. Lesson #3 Blocks of colour are better than patterns. Some of us might think that a matching pattern ties things together, but it can actually become more of a distraction. I know this from experience; as a student I was often distracted by the mismatching of patterns that my teachers put up in the classroom. For this reason, I stick to blocks of colour as much as possible. If I do use patterns, I do the best I can to keep them properly aligned (ha). My students are also the type who will latch onto absolutely any distraction. The slightest opportunity to avoid focused learning will be snapped up by my kids. They will not only stare at a pattern disaster in a quiet escape, they will raise their hand and nag me about it so that it distracts the entire class! While I like pretty patterns too, it is easier to stick with block colours. The advantage of block colours, means that you don’t have to change an entire board to update it. You could change the lettering or the accents and the words, but the background can stay the same. Here are a few examples of backgrounds and borders that are simple and less distracting. Remember that visual clutter (like over flowing shelves) can change the whole vibe of a room – especially a classroom. In the same way, too many patterned borders/ backgrounds or even a uniform busy border can become overwhelming. Different colours are used but they are in big blocks. This photo was taken in my old classroom! This one has a block colour for the background of the board and then a simple border across the top of the title. This particular display is still a bit too busy for my liking. Today I have a tip rather than another website to visit. Bed linen (single bed sheets especially) and tab-top curtains make great block coloured backgrounds for bulletin boards. You can pick these up from your local discount store for a reasonable price and cut them to fit the various boards in your room. If you are like me and have to “create” spaces that can be used as bulletin boards, bed linen or curtains can simply attached to the wall or over a window and you have a defined space ready to go. Add a simple border (with a contrasting colour) and start attaching accents. This is also an economical way of adding board space to your classroom that can be moved with relative ease. At the end of the term – if it’s practical, remove the fabrics and take them home to be laundered. This way your linens – although cheap- will last a little bit longer and you can use them again and again. If each term is too difficult (i.e. the fabric is used for a year round board), then take it down at the end of the year and clean it up. The other fun thing about bed linens, is that you can paint titles onto them. What bulletin boards have you created? Do you prefer patterns over block colours? Do you have an adhesive preference? Where do you purchase your supplies? What do you use for backgrounds and borders? There are a lot of pins on Pinterest about bulletin boards and lots of blogs that share ideas. The conversation points are endless on this topic, so please share with us! As always, photos are much appreciated.